I begin reading the signs. I have been developing a new Gap Year program called: Place Corps and have been researching ‘Corps’. I have been researching what is at our core, and how the word relates to the heart. This sign greets me as I journey out to Succurro on a Friday I have taken off of work, to go exploring and drive over the mountains on new roads to meet Owyn and Damian. It is a sign affirming I’m on the right path. The destination is my journey. I learn I need to take Fridays to dedicate to my Succurro project. A project I imagine as a book, as my curriculum re-imagined. I learn I need to take Fridays to pay attention to my creativity. I learn Friday feels good when I go exploring. Following the signs. Friday-Feel-Good #1. A book of books that share my Creativity + Courage™ curriculum as a tool for facilitating connection, creative expression and transformation. It is a field guide designed to help the reader identify wildlife. It is a book of good orderly directions. It begins by being lost and ends being found in the lost & found. What makes a book of days? How much air and water is mine? These are all titles of works in progress, isn’t everything a wip. Book of Good Directions. Plenty of space included to write your to-do’s and map your day. I created an experiential workshop that orients participants to their individual and collective purpose—creating a new day plan aligned with qualities of integrity, as a visual map forward. 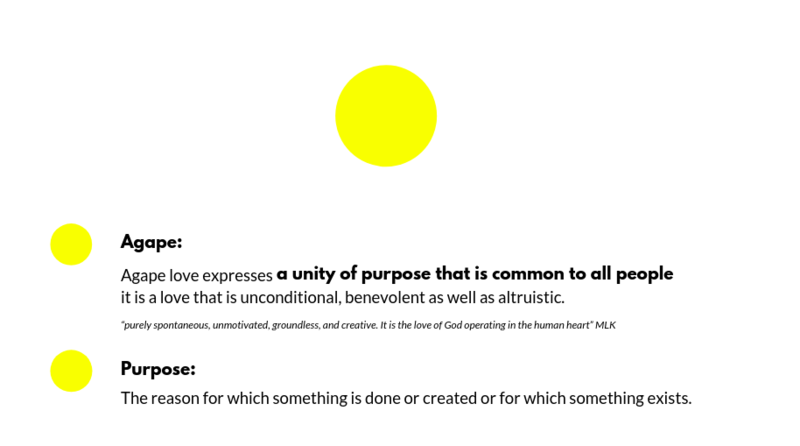 In developing the workshop I recognized that our collective center, or our core, is Agape and this is a shared human purpose. I created a PDF of my purpose mapping lesson, to easily be distributed. This was a new creative challenge of translating an experiential lesson into a written document. I used the tools I created in the workshop to provide me the direction and courage to create my self-directed artist residency on Amtrak. I led this workshop twice in January 2019. First for a seminar of thirty-five fellows at the Good Work Institute, and afterwards for a smaller group of creatives at Instar Lodge. In February 2019 I embarked on a self-directed artist residency on a cross-country Amtrak ride. I loosely held intentions to write my ‘Field Guide to Becoming’ book but permissioned myself to be open to the experience and process of being as the ‘work’. I quickly learned my first lesson: Be here now, be present for the experience of movement. Look out the window, notice what you see—that is more than enough. My trip became a weaving of synchronicity which reminded me of this ability of mine, to see wayfinding signs. Now I am home. Writing the story of the trip, A Ride of Passage. Now I am home rerouting my days. Now I am making time for novelty as my creative responsibility. Now I am making time for discipline in service of my creativity. Pathways as seen out the window of the train, somewhere in America. A commitment to my creative purpose by following the signs. I want to actively be the research project, exploring a reality guided by my intuition and ability to read wayfinding signs of good direction. I want to develop trust in my abilities. I want to develop my abilities to share my creative practice more fully. I want to heal trauma’s that perpetuate feelings of low-self worth and I want to heal these through my creative process of Agape. I’m doing this by slowing down to notice my feelings in response to what is happening in the moment. I’m doing this by showing up with regularity to a self-practice of journaling. I’m doing this by by paying attention to my heart as compass.